Well it took some time we made the Buy day low at the TTT violation levels. Markets held there for nearly 1 hour then on the second touch we had a nice TS1 form right on the TTT numbers so far 4R trade. Enough for me. Time to get ready for a nice weekend away. 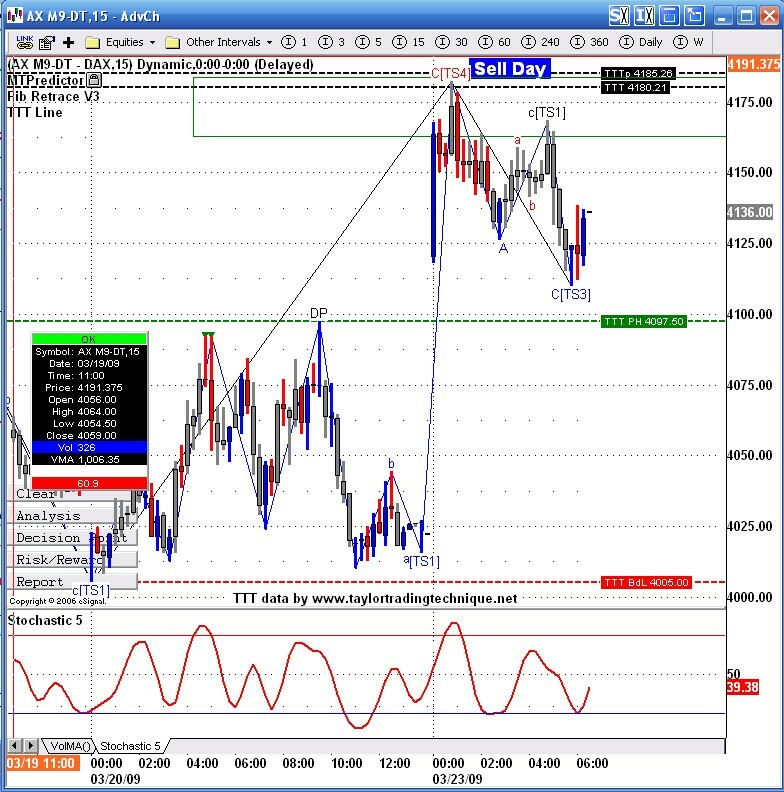 the small green triangles on the chart, are these failed signals such as failed DPs or Ts1-4 ? 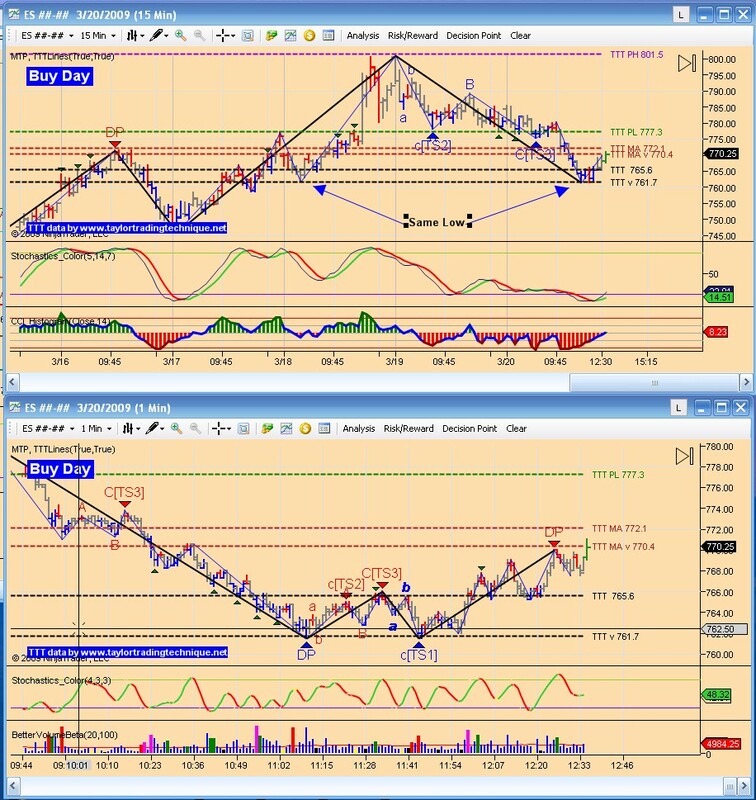 Bonjour Martin, yes these green triangles are failed signals, Richard and I are using an old MTP add-on version they give more signals but you will get a lot of failed ones specially on a 1 min time frame, reason why we combine these with TTT and Fib clusters. Hi Laurent, thanks for clarifying ! Monday 23rd March a Sell Day, a huge gap up on both Dax and Ftse right to the R3 pivot levels, ideal short sales , 30-40pts price drops. Ofcourse not strictly Taylor, but this is 2009 Intraday:))), have to take the any opportunity the market gives as unfolding price action dictates. I am please to announce that the Add-On for Ninja Trader and ESignal now includes the Asian markets, Bond Market and the Soft Commodities market. 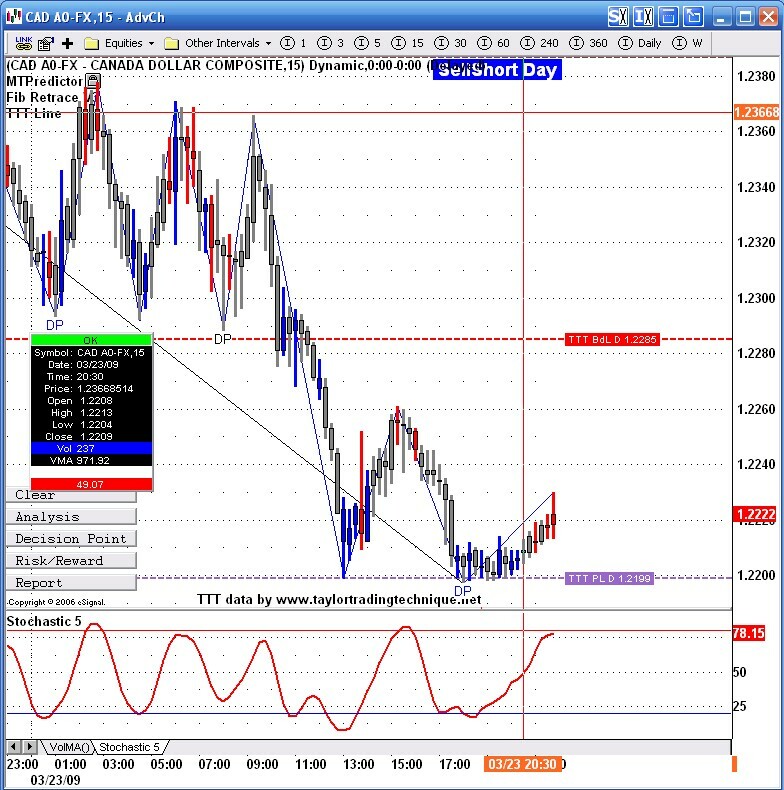 Some of you have been asking me about FX trades. Well this is a trade I took a few hours ago. CAD is on a SS day and opened below the Buy day low. I thought I had missed the boat but the pair came back to test the previous day low. I am long at 1.2205 and aiming for at least the Buy day low of 1.2285. Now that the price moved in my favor I moved my stop to 1.2190 making this a 15 pip risk for a minimum 75 pips reward. Lets see what will happen while I sleep. What a Sell day yesterday, no wonder most people find Taylor totally confusing, was a struggle and frustating period for me for sometime, Great TVGR effect, reminded me of 6th Feb, however that a Buy day with the similar TVGR effect and Decline Zero. Today SS day if off to a cracking start, Dax penetrated yesterdays high by 3-4pts and prices went south, on Ftse there was a failure to penetrate.